One for the kiddies/parties perhaps? For the first time the Football Assoociation has given full endorsement to a computer game. 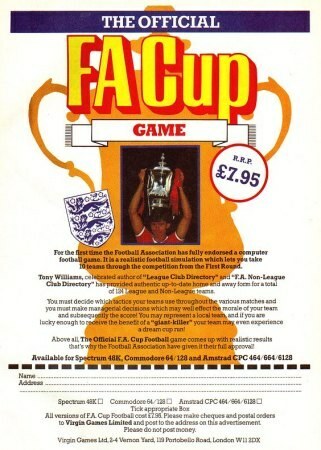 Sportswriter Tony Williams has teamed with Virgin Games to produce the most realistic football simulation yet. It is based on true F.A. Cup form as you will see from the realistic results this games produces. By a combination of strategic tactical decisions and good management you can lead your 10 teams to success. You can choose a local non-league team to be one of your 10, and with the help of in-built 'Giant-killers', you may even achieve a dream cup run! Become Manager to 10 teams of your choice in this exciting simulation of the F.A. CUP Competition. Begin in the first round or alternatively go straight into the third round to face the might of the First and Second division clubs and battle to the CUP FINAL. Authentic Cup Draws present cup ties in which real life form decides the winners; however you could just turn the tables and provide a result by making some tough managerial decisions and by a shrewd choice of tactics. You never know; your team may just be the next GIANT KILLERS. - Their best performance in the competition. - Their performances in the last ten years. - Their past five home F.A. Cup results. - Their past five away F.A. Cup results and their estimated away following. These factors are also used for the Non-League clubs.